At stake was union representation for 4,700 employees of the Milwaukee Electric Railway & Light Co., the giant utility supplying the city with both electric power and mass transit. It ended with a union victory that helped pave the way for further labor inroads in the city. In 1934, most electric company workers were working under a contract negotiated by their long-standing in-house brotherhood, the Employes’ Mutual Benefit Association. The American Federation of Labor was hungry to represent those workers. But S.B. Way, the company’s president, knew few of his employees were AFL members and he was confident the courts would back the firm’s existing labor agreements. Perhaps Way thought a strike, if one happened, would involve few workers and have little impact on operations. If so, he should have paid more attention to his own company’s history. 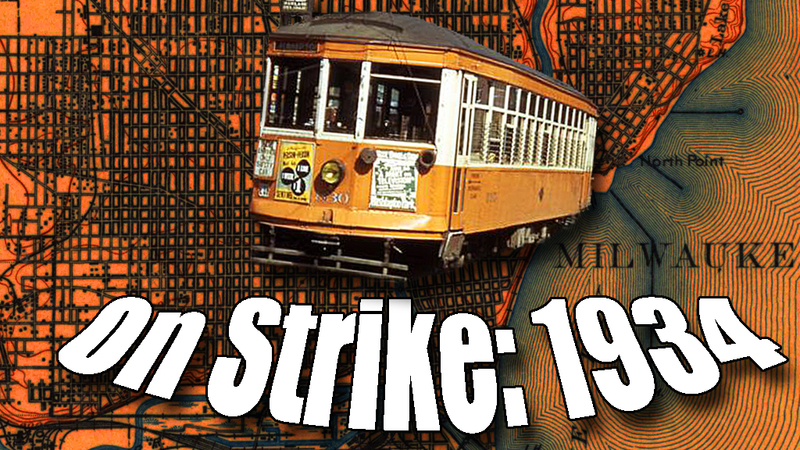 In 1896, a transit strike lasted two months and was marred by violence, including torn-up rails, cut power lines, and the fire-bombing of streetcars. The company’s Employes’ Mutual Benefit Association was established as a result of the 1896 strike. Whatever his thinking, Way flatly refused to negotiate. A frustrated AFL, with backing from the Milwaukee Federated Trades Council and the state Federation of Labor, called a strike for 4 a.m. on June 26th. At first, it seemed Way had correctly judged the situation. Only 5 percent of company employees walked out. By midmorning most of the picketers gave up marching and went home. The city’s lights were on and its streetcars were running on time. That night all hell broke loose. A small-scale transit strike in 1934 became major news when thousands of rioters joined in. As darkness fell, a crowd estimated at more than 30,000 jammed the streets around the utility’s power plants and the car barns where streetcars were maintained between runs. For three nights mobs gathered, stones smashed streetcar windows, trolley pole ropes were cut, and motormen were dragged from the cars and beaten. Company-hired private security battled the rioters and overwhelmed police fired tear gas and made mass arrests. Union officials blamed communist agitators for the violence. Actually no one knew quite what to make of it all. Puzzled newspaper reporters noted many of the protestors were young. Shorewood High School students, for example, marched in picket lines outside the Oakland Avenue car barn. 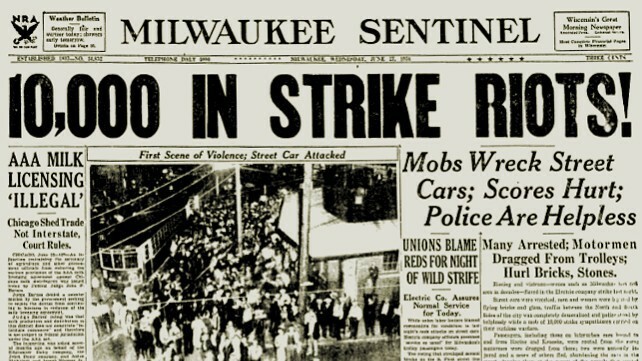 When 25 building trades and crafts unions voted to call for a general strike, the dispute appeared certain to spread citywide. 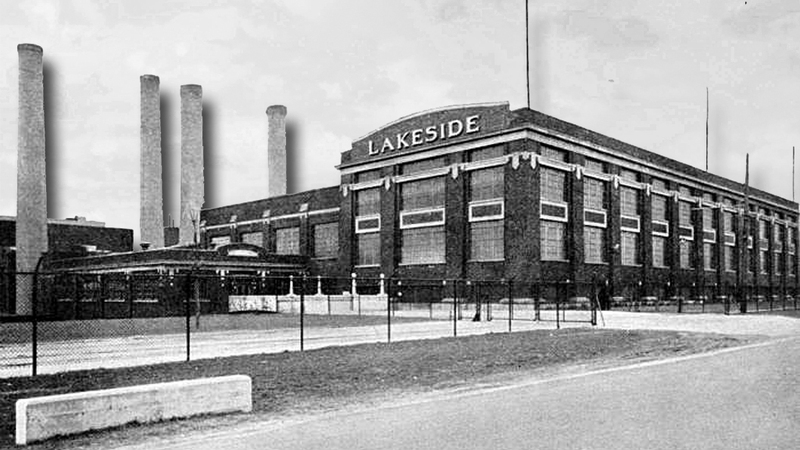 The Lakeside Power Pant in St. Francis was the scene of a fatal electrocution of a demonstrator during the transit strike of 1934. On the night of June 28th, a mob of 2,000 people rushed the company’s Lakeside Power Plant in suburban St. Francis, where 180 non-striking workers were staying around the clock to keep the city’s lights on. While rioters smashed windows and attempted to force their way inside, a 24-year-old strike sympathizer named Eugene Domagalski joined a group armed with a steel post, which they proceeded to ram through a window – and straight into the back of a high-voltage control panel. Domagalski was fatally injured. One of his companions suffered severe burns. That same night, a bomb destroyed an Electric Co. power line near Vernon Center. Enough was enough. The next morning S.B. Way invited officials representing three AFL-affiliated unions to his office. Also in the room was Father Francis Haas, a priest serving as a federal negotiator. Way looked over the union’s demands, and said, “Gentlemen, I agree in practically everything here.” After some additional give and take, in which both sides showed willingness to compromise, an agreement was hammered out. The deal was presented to the rank and file at a meeting in the downtown Elks Club. Father Haas, the government negotiator, opened with a prayer before he read the agreement. The deal was quickly ratified. The strike was over and a local legend was born, in which the power of prayer was credited with settling the dispute. In 1952, the electric utility company sold its transit operations to the newly formed Milwaukee & Suburban Transport Co., which evolved into the private non-profit Milwaukee Transport Services. MTS presently operates the bus system under an agreement with Milwaukee County. Strikes have stopped transit service on a few occasions since 1934, but nothing has equaled the four days of bloodshed and violence, which rocked the city 81 years ago. More related to organized labor starting to flex its muscle, I think. Because, wow, Milwaukee soon became a big union town. As for the GM/streetcar conspiracy, I believe it has been pretty thoroughly discredited. In Milwaukee’s case, buses seemed like a better idea. You could drive them anywhere, no wires or tracks needed. Also they were less prone to get stuck in minor snowstorms, and were much more comfortable than the antiquated rattletrap streetcars they replaced. It’s fun to see streetcars now regarded as the bright, shiny new thing in transit. Truly, what goes around comes around! What caught me most about it was the timing–from the setup I was expecting something in the late 19th century (like the Bay View massacre). So, I was only off by 50 years. When buses (both electric and internal combustion) did replace Milwaukee’s streetcars, economics were the deciding factors. GM/National City Lines did not factor into Milwaukee’s streetcar demise. But it is a total myth that streetcars were ” prone to get stuck in minor snowstorms.” This myth, born in recent years, can be disproved by looking into Milwaukee’s transit history as well as the history of other streetcar operations in the Snow Belt. The blizzard of 1947 stopped virtually all street traffic within the city as well as the inner ring suburbs. The blizzards of the late 1970s and early 1980s also stopped some transit service. I remember having to walk to my job after one particularly bad snowstorm, circa 1979. I saw buses and private automobiles trapped in the snow at Appleton and Capitol. That being said, the company never did buy the modern streetcars (PCCs) other cities were buying during the 1930s and ’40s. The company saw it’s future in electric power generation and distribution. They wanted to get out of the transit business, especially after the strike. But they wanted to keep the transit side of the business up to make it attractive to prospective buyers. Electric buses (“trackless trolleys”) began replacing streetcars on the more profitable lines and gasoline buses, which the company used on lightly traveled lines since the 1920s began replacing streetcars during the 1930s, though a few lines were trimmed back and replaced with gasoline buses on their outer ends during the late 1920s. This not only freed the company from track maintenance, but also freed the company from franchise requirements to maintain pavement within the “track zone.” As for the overhead wires, the company’s electrical plant was still in good working order and ten lines were converted to electric buses between 1936 and 1955. Several of these lines were even extended beyond the rail lines they replaced.The first diesel buses were purchased in 1950 and like the trackless trolleys, rode nicely on freshly resurfaced streets. 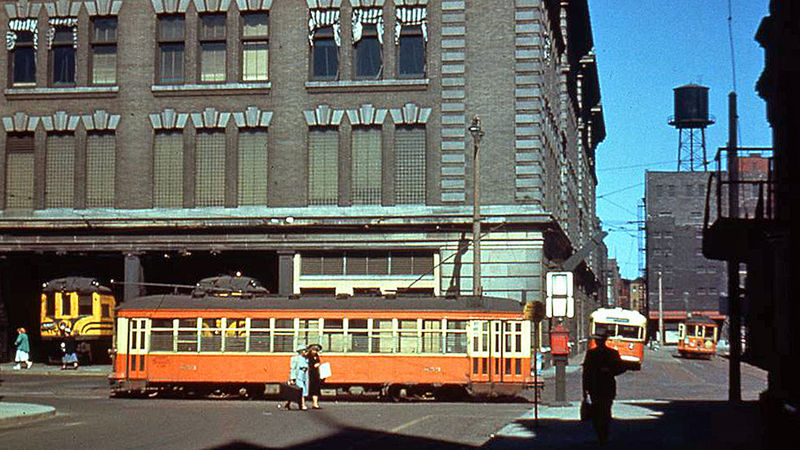 I do agree Milwaukee’s last streetcars were indeed “rattletraps”, especially after M&ST took over and simply did just enough maintenance to keep them serviceable until enough rubber tired vehicles were available to replace them. The last series of streetcars were designed circa 1920 and were built between 1920 and 1929. They were not as comfortable nor as smooth riding as some of the heavier cars purchased previously. Their less than stellar ride quality was amplified by worn out trackage as time went on. People who recently restored a Milwaukee streetcar at the Illinois Railway Museum found some makeshift repairs to the trucks (wheel sets) which would not have been tolerated when TMER&L was running the system. Very informative comments — thanks!